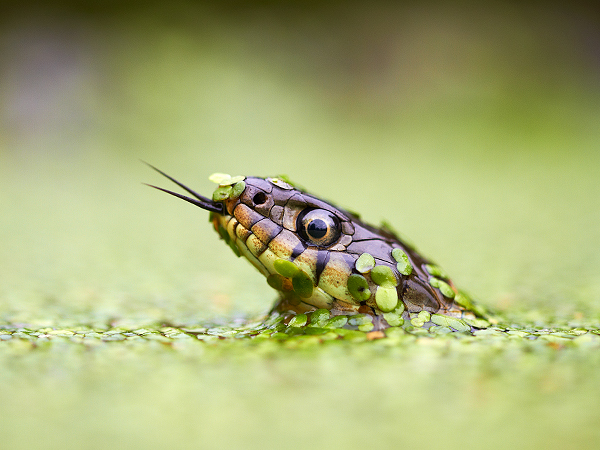 The Grass Snake have a large range across Europe and can grow up to 200 cm in length, but in Britain they rarely grow more than 120 cm and often much less. This is longer than the Adder and they are Britians longest snake. They are non venomous and like damp habitat close to water, indeed Grass Snakes are excellent swimmers. They are found in Southern Britain where they like a diet of frogs, toads, newts. Grass snakes hibernate for half of the year (October to April). They also like warm sunny days and can be identified by there grey green colour, and a black line that runs from the eye to the mouth. Their underside is a white or pale. They emit a foul smelling liquid and play dead when threatened. Unfortunately their numbers is in decline due to habitat loss.